I usually try to theme each day’s post in relation to the featured drink. Today’s subject may be a bit of a stretch, but given the word “loop” and “splash” are there, I wanted to discuss my favourite amusement park rides from around the world. So, let’s secure our personal belongings in the seat front pouch and hold on for dear life! When you combine a kid’s movie with a turbulent rollercoaster, you satisfy all of my needs! 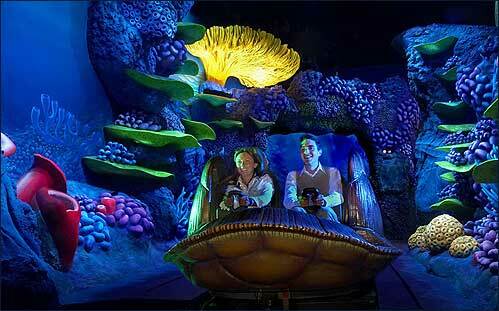 This attraction takes guests through the East Australian Current, riding on Crush the surfing turtle’s shell. What starts out as a normal coaster turns (literally) into a very memorable one, when your vehicle begins spinning with the gravity and speed created by the ride track, at one point going into a dark room that gives space mountain a run for its money. Mrs. Sip and I are continually surprised the ride hasn’t been picked up by any of the other Disney parks. This is one of those classic 3-D movie attractions, but with the twist that you move from scene-to-scene in your ride vehicle. You speed, web sling, and plunge through the streets of New York, watching Spidey battle the Sinister Syndicate. Spider-Man rules, so this attraction gets bonus points on that fact alone. I’m not sure why so many attractions are trying to gain revenge on their riders (Montezuma’s Revenge also comes to mind), but this stand-up coaster is a wonderful salute to the Batman franchise and the insanity of Edward Nigma. Highlights of the actions include the pumping techno soundtrack and the vertical loops that wraps around the launch lift. 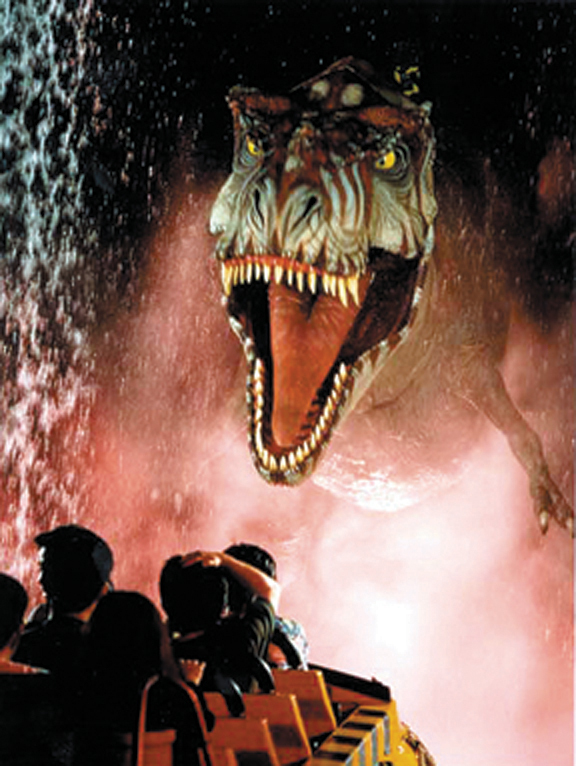 I never really got the obsession with Jurassic Park until I rode this water ride. Everything starts off all nice and normal as you take a relaxing trip through pens belonging to many herbivore dinos. That all takes a drastic twist when your boat goes off course and you enter raptor cages, with the looming threat of an accidentally released T-Rex. Before you know it, the only route to safety is a dramatic plunge into the cold waters below. Splash Mountain, Space Mountain, Big Thunder Mountain, and Matterhorn Mountain are some of the original amazing E-ticket attractions to exist and are must hit rides for any visit to the Disney Parks that house them. Without these tracks, so many other advancements in theme park technology would not have been possible. When they warn you not to go on rides if you have back or neck problems, they were probably thinking of this attraction. It’s a classic wooden rollercoaster that spans the parks and even crosses over into the parking lot. The wildest part about it is that you’re constantly ducking your head, thinking that it’s going to get sliced off by the beams above. The rapid advancements in ride technology are amazing. This attraction brings out the competitive spirit in riders as you compete with your mate and all other guests, in fact, to record the highest score possible. 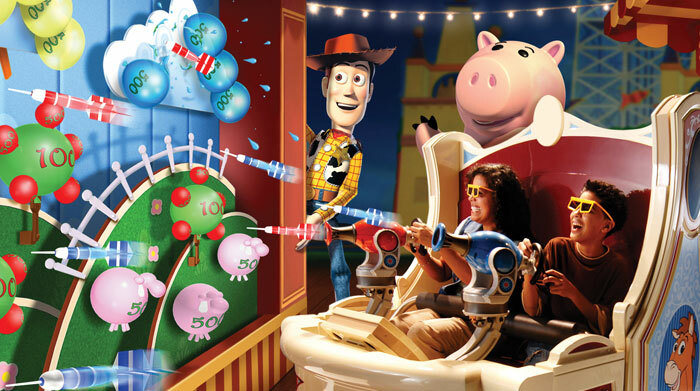 Throw on some 3-D glasses, and shoot at as many targets as possible on the screen in front of you before moving on to the next Midway challenge. Each ride experience is different, providing you don’t mind waiting 40 minutes to an hour in line for this popular attraction! I refuse to buy ponchos for water rides… that totally defeats the purpose. But in this case, as we watched ride attendants vacuum water out of each boat that arrived at the loading zone, we were happy we’d taken the advice to grab a couple. I’ve never been so drenched, in my life… even with the damn poncho. Had it not been a dreary English spring day, we would have rode the ride – which featured a ton of special effects, as well as going backwards in a log flume – again, but as it was, we were already chilled to the bone. Rides that have their own soundtrack are amazing… but how about a ride where you get to pick the song of your choice, which is perfectly edited for the duration of the track. You can pick from rock, rap, country, dance and just about everything else. There are even hidden songs that you can access. That will keep the guests coming back for more, looking for the perfect jam to their experience. While there are many theme parks we have yet to visit, this is a list of some of our favourites thus far. Sadly, I had to leave so many rides I love with all my being off this list. Hopefully I can squeeze them into a future post. The final drink in my trilogy of Loopy Vodka recipes was pretty decent. 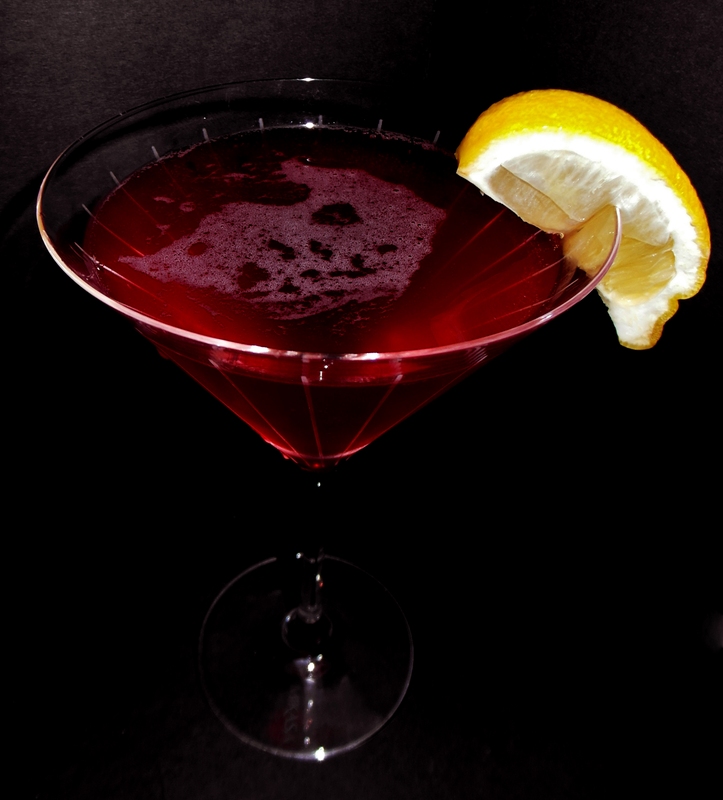 The mix of half Cranberry Juice and half Ginger Ale was good and worked well with the spirit. I should have done more with the garnish, but I guess I got a little lazy.